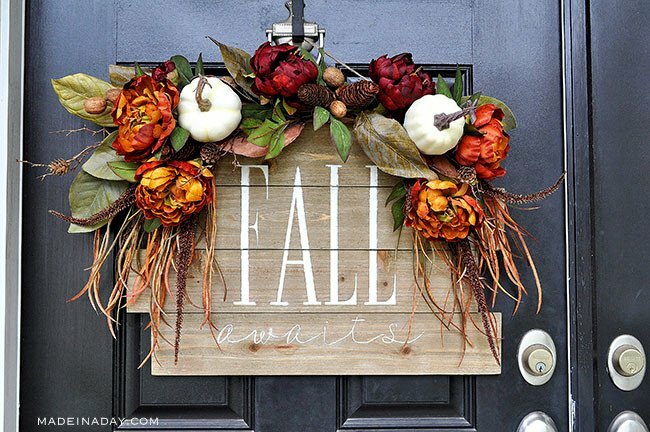 Looking for a way to save money but still have a great looking welcoming front door this season? 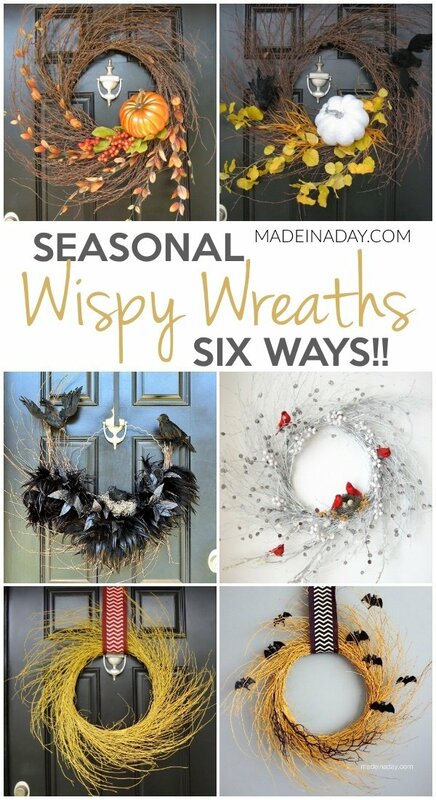 Then this Seasonal Wispy Wreaths: Fall, Halloween & Winter collection is for you! 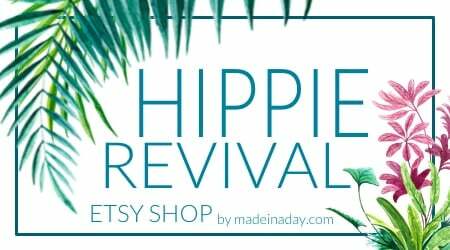 See my Wreaths + Plants page for more fun creations. 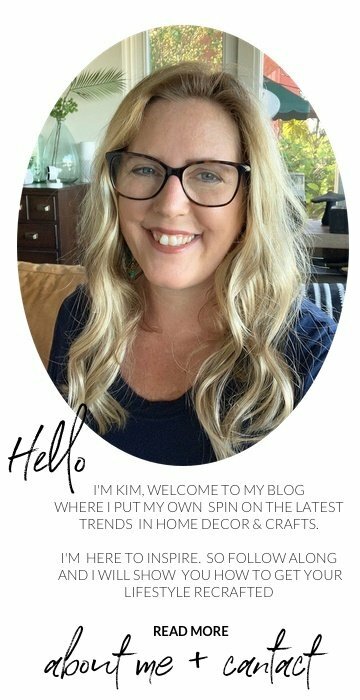 One of the first projects I made when I started this DIY blog was a series of wispy wreaths. I have double doors on my home and going out and buying two wreaths for each season can get pretty pricey. 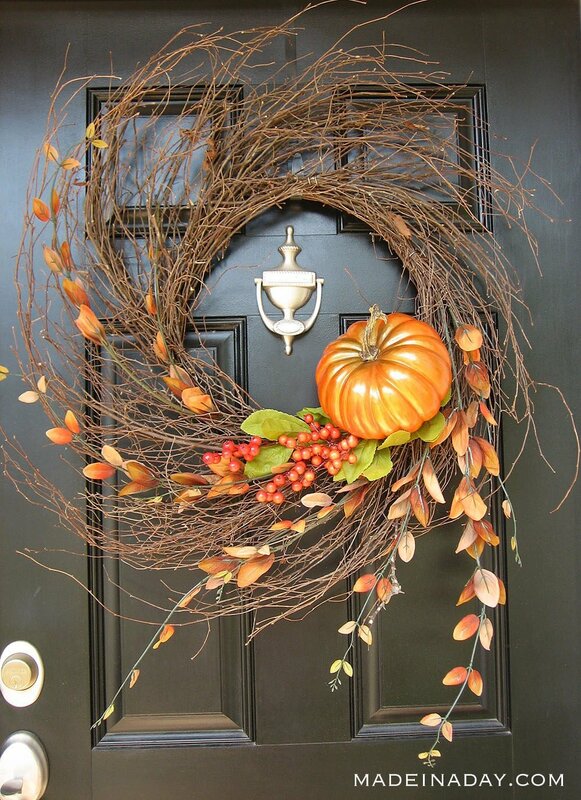 Plus who has the room to store a wreath for every season? To fix this dilemma I purchased two plain grapevine wispy wreaths and changed them which each holiday. I went from Fall to Halloween then onto Winter. 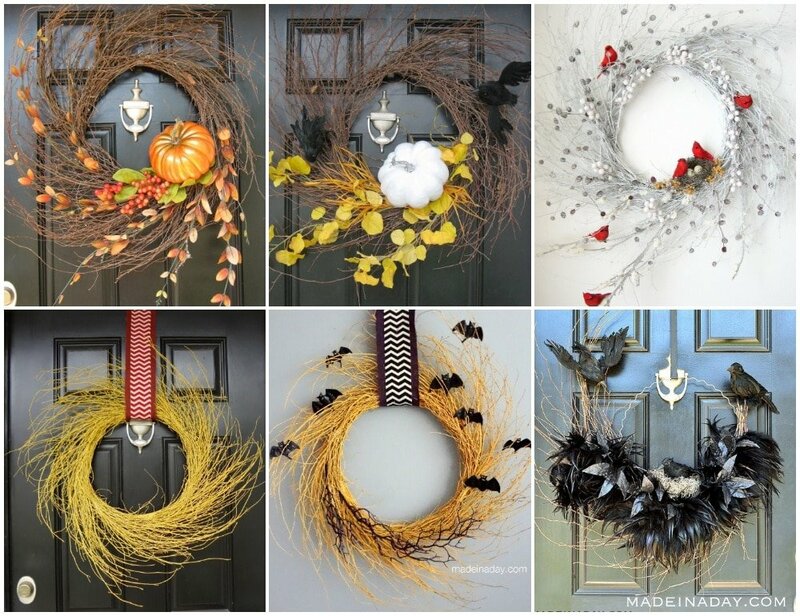 Let me take you on a tour through each one of these amazing wreaths. For the full details and tutorials on any of these wreath projects see the links under the images. The first wreath I made was this one. When I bought the floral picks to make it I went ahead purchased the Halloween yellow stems and orange feathers for the next one. That way I would have them on hand when I was ready to change them. 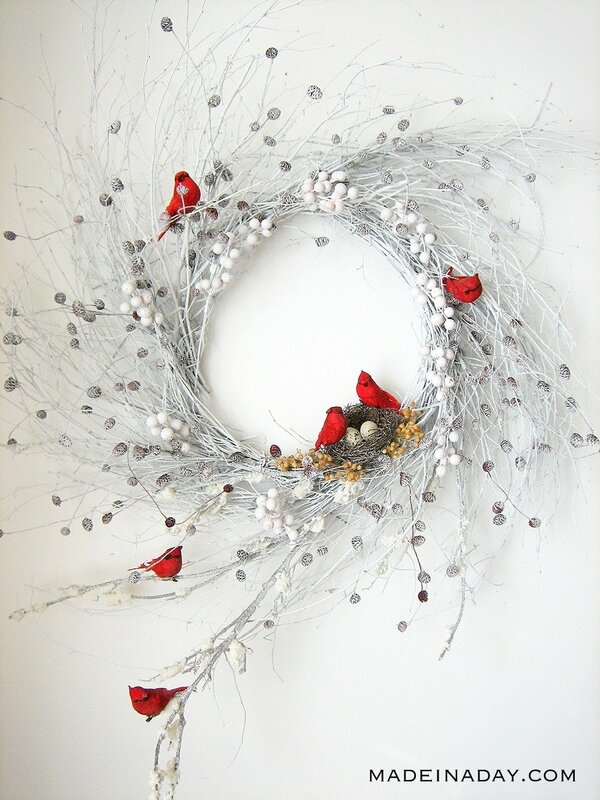 This particular wreath is one of the most popular ones in the series. It is simple yet perfect for fall. 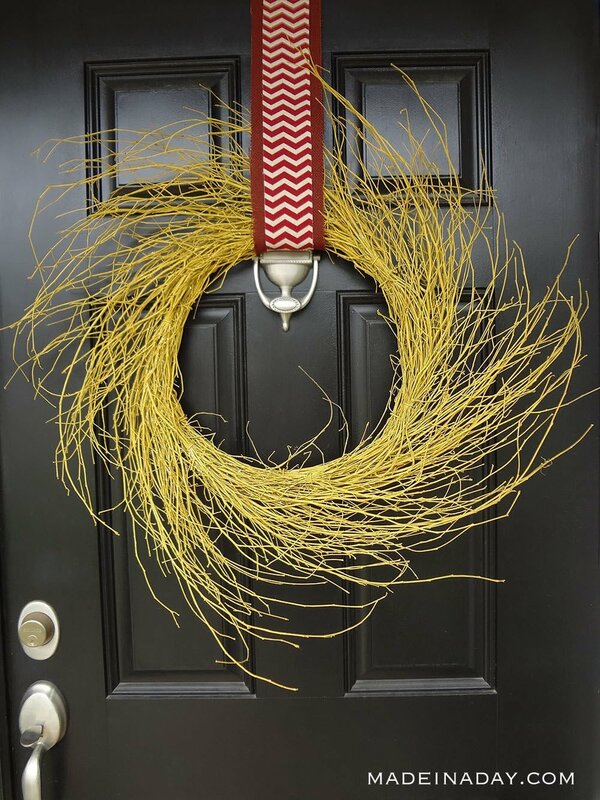 This wreath is equally as striking as the Autumn Wispy Wreath. The yellow and orange foliage along with that white pumpkin just pops! All I did with this one was paint the pumpkin and change the stems. This one is simply elegant and yet spooky but not too creepy for Halloween. This beauty has been an internet fav since day one! Something about those red cardinals popping against the white winter snow makes this one so peaceful. Some people think that when you see red cardinals around your home, your departed loved ones are visiting. They are also a symbol of love and peace. I did not know all of that when I made it but I have since had my own red cardinal experience and I think it just may be true. I have a feeling that is why this particular wreath has gotten so much attention in the last seven years. The number of comments on it is staggering. I do confess when I made the winter wispy wreath I only made one and kept it inside for the holidays. 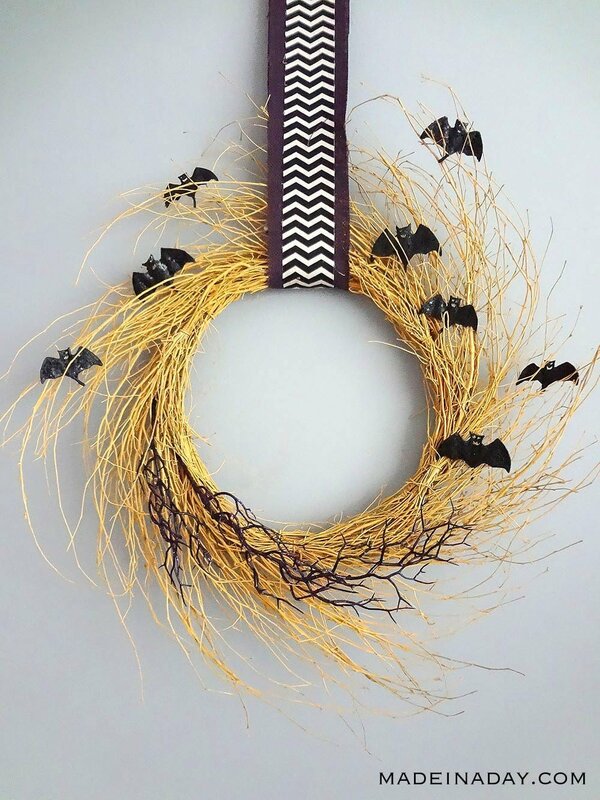 For the next fall season, I purchased two more wispy wreaths and made the Chevron Yellow Harvest Wreaths that went onto becoming the cute Halloween Bat wreaths. This wreath is so simple to make. Just spray paint the wreath and add some golden glitter. The chevron trend was going strong when I made these. 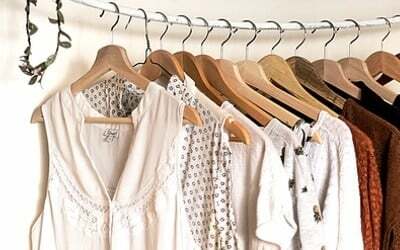 The chevron striped ribbon could be swapped out with a different design that is more on trend for today. This was so easy to change to Halloween. 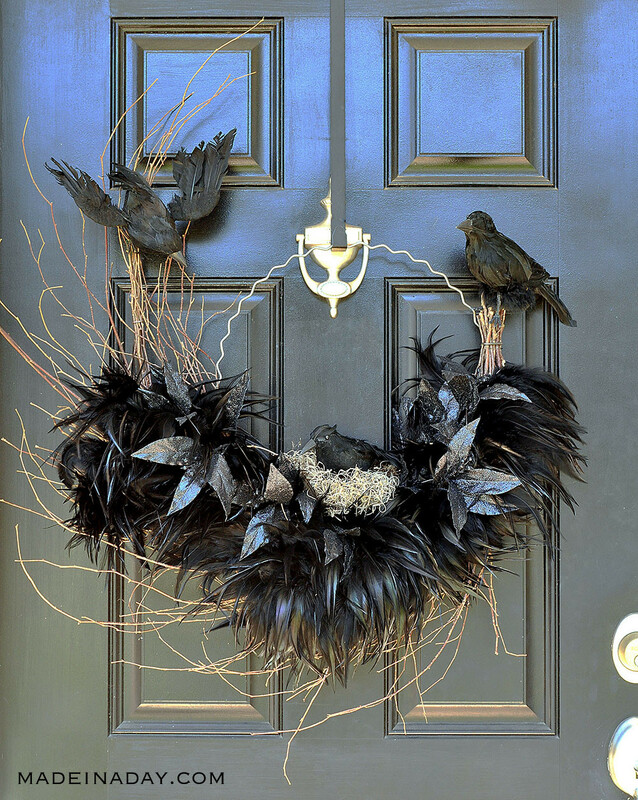 I just added a few stems of creepy glittered Halloween floral picks and placed bats all around the wreath like they were roosting in the trees. 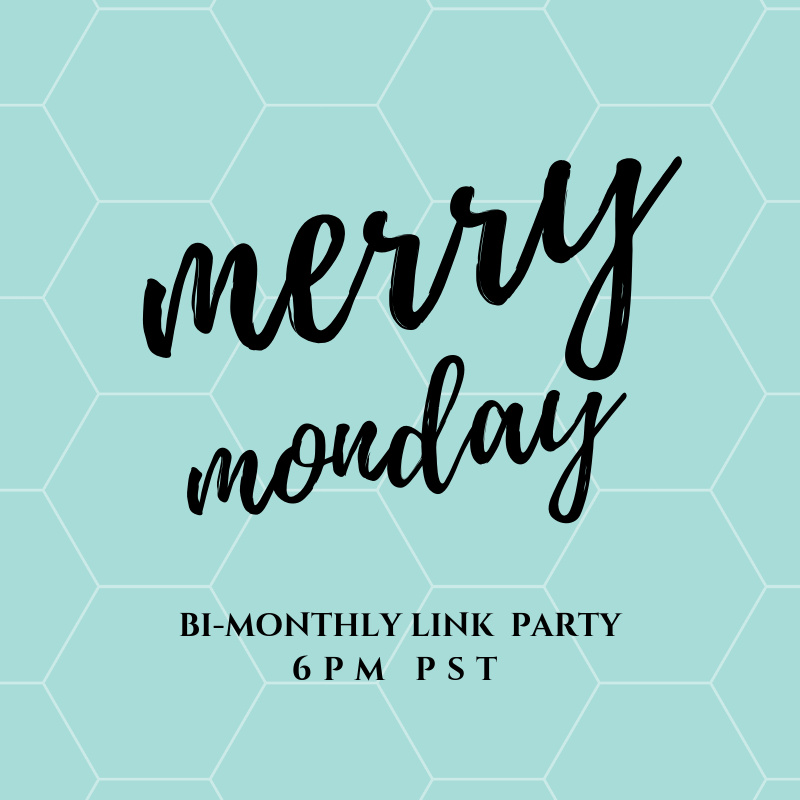 I also changed the color of the chevron to compliment the holiday. 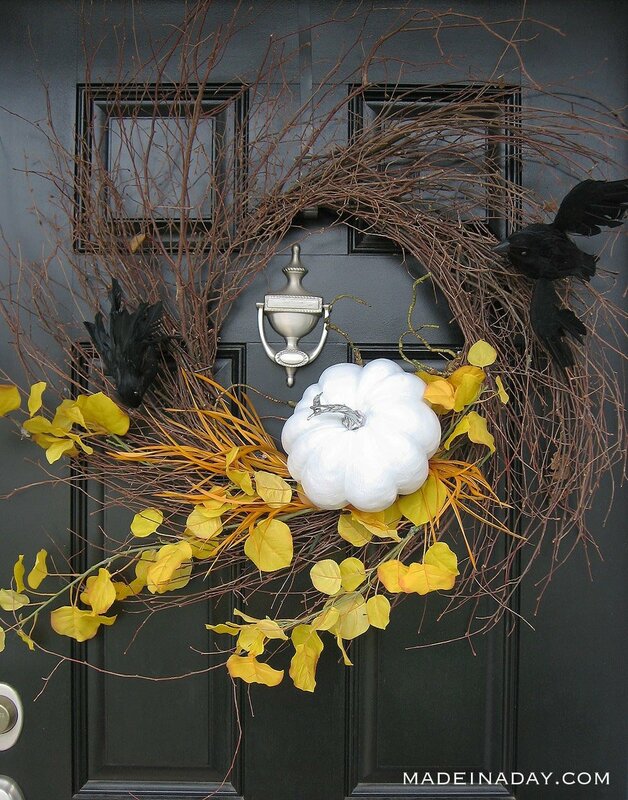 Last but not least….the Ravens Nest Halloween Wreath! This wreath is my absolute favorite. 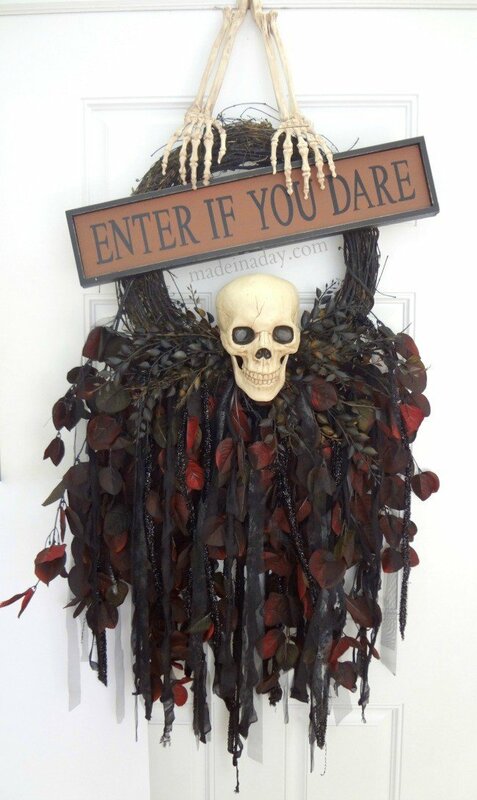 I made this last Halloween from a wispy wreath that was coming apart. It had lost its top branches and I was going to toss it out. That’s when I was inspired to make a nest out of the remaining bottom twigs. This elegant beauty would be an amazing indoor Halloween party decoration. What a great way to scare your quests! 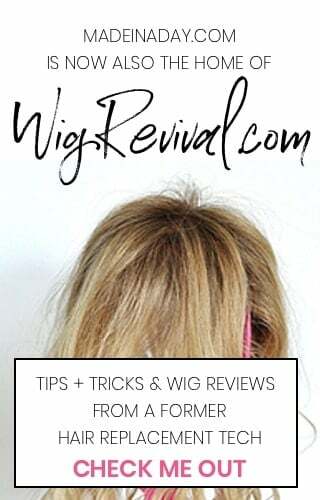 I hope you enjoyed a look at my quick change holiday wispy wreaths. 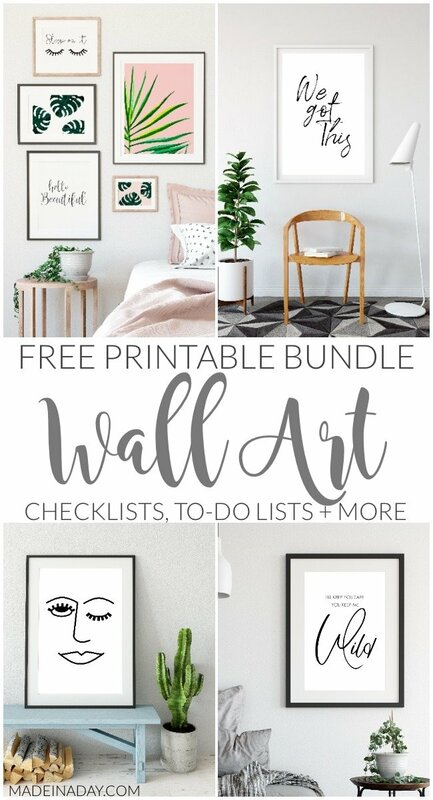 Maybe inspired you to make one or more for your home this season. Make sure to visit each one for a more detailed tutorial on how I created them! That snow white one with the red robins on it is so beautiful! !